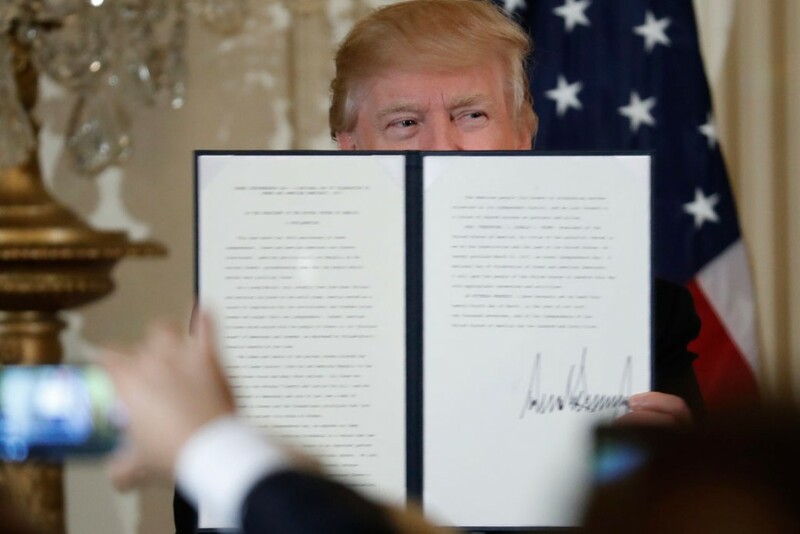 After failing to pass his health care bill that would strip 24 million people of health coverage and seeing his Muslim ban stymied in court, President Donald Trump has staked the success of his first 100 days on his efforts to overturn regulations legislatively. But analyzing these efforts shows that, much like his agenda overall, they put the interests of large corporations before those of the American people. All told, Trump’s legislation will provide businesses with more than $7 billion dollars in giveaways over the next decade while causing a net loss in jobs, millions in reduced wages, and the elimination of important consumer protections. It’s no wonder that Trump and majority leaders in Congress are trying to keep the particulars of these bills under wraps. While Trump has claimed that he will reshape the Republican Party into the party of the American worker, his legislative agenda to date has been nothing but damaging to working- and middle-class families he vowed to help. 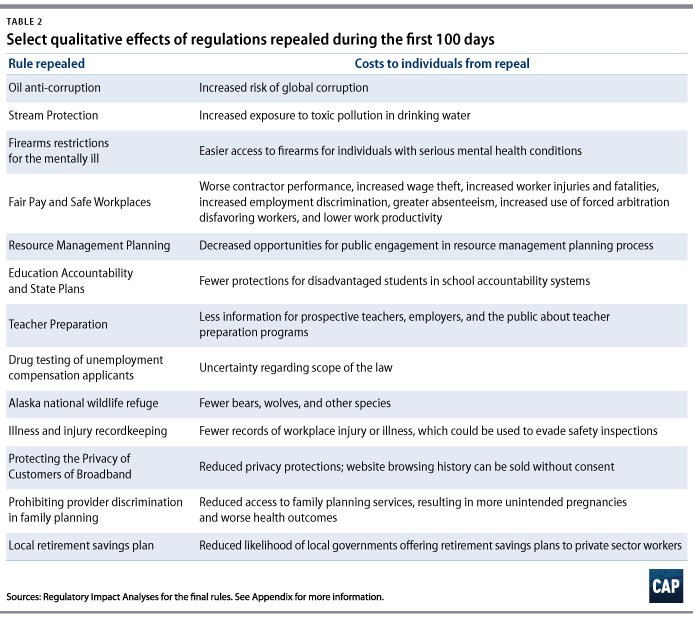 Because agencies are required to estimate the costs and benefits of any rules they issue, it’s possible to determine some of the effects of repealing these regulations by looking at those with quantifiable effects on individuals and industry, as shown in Table 1. * The repeals thus far have been a boon to big business, which will see annual benefits of at least $700 million. And far from creating jobs or boosting wages, they will have negative effects on hardworking families, including, on an annual basis, a net loss of jobs, $3 million in lost wages, and $57 million in increased costs as a result of higher carbon dioxide emissions. And this does not account for the significant costs of repealing these regulations that are harder to quantify, such as decreased worker safety, greater risk of wage theft, and increased exposure to dangerous pollutants. For example, one repealed regulation would have limited labor-law violations by federal contracters, a significant benefit for workers given that the 49 federal contractors with the most serious violations of federal wage and safety laws paid $196 million in penalties and assessments between 2007 and 2012, including tens of millions of dollars in back wages. While repealing some of these regulations would have marginal benefits for consumers, such as decreasing electricity prices by less than 0.1 percent, the significant costs far outweigh any benefits. As noted above, these numbers only tell part of the story. For example, thanks to the repeal of a Federal Communications Commission privacy rule, internet service providers can now sell people’s browser history to third parties without their consent. Trump and Congress also eliminated a rule that would have ensured better access to family planning services, which could result in more unintended pregnancies and worse health outcomes. Working with Congress, Trump eliminated two Department of Labor rules that would have helped protect workers from job-related injuries and exploitative and illegal employer practices. And by overturning a rule that would have protected streams from pollutants resulting from coal mining, Trump is putting 6,000 miles of streams and 52,000 acres of forests at risk. Among the other rules that Trump and Congress have seen fit to overturn is one requiring oil, gas, and mining companies to report payments to foreign governments in order to reduce global corruption; a rule that would help prevent individuals with serious mental illness from obtaining firearms; a regulation that would prohibit hunters from killing bear cubs; and a regulation making it easier for localities to establish retirement plans for private-sector workers whose employers do not provide them. Unlike eliminating regulations through the regulatory process, under the CRA there is no need for the Trump administration to analyze the costs and benefits of these deregulatory actions or allow for public input. 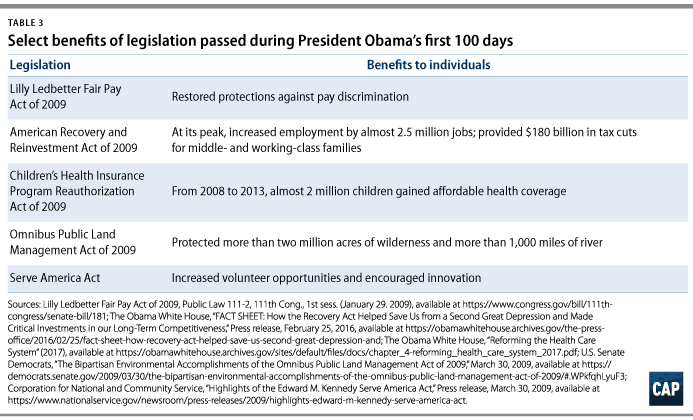 The difference between Trump’s rhetoric and actions is even starker when compared to President Barack Obama’s first 100 days in office. One of President Obama’s first acts was to sign the Lilly Ledbetter Fair Pay Act, which restored protections against pay discrimination that had been stripped by a Supreme Court case. The American Recovery and Reinvestment Act, signed into law by President Obama in February 2009, increased employment by almost 2.5 million jobs at its peak. It provided more than $180 billion in tax cuts for middle- and working-class families, including cutting taxes by up to $800 for 100 million Americans in 2009 and 2010. It also included $300 billion in public investments, including more than $90 billion toward developing a clean energy economy; $48 billion to improve our transportation infrastructure; and more than $50 billion to states to help keep teachers on the job and avoid drastic education cuts. President Obama also passed a bill providing $33 billion to help children receive health coverage. From 2008 to 2013, before the major coverage provisions of the Affordable Care Act took effect, almost 2 million more children gained access to affordable coverage. The program also has provided significant financial relief to low-income parents: 92 percent of program enrollees’ parents never or rarely have problems paying their child’s medical bills. In addition, President Obama passed the most significant conservation legislation in 15 years—which protected more than 2 million acres of wilderness and more than 1,000 miles of river—as well as a bill that expanded opportunities to volunteer, focused service on important national needs, and encouraged innovation in addressing local and national problems. The results from Trump’s first 100 days couldn’t be clearer: The White House and Congress are advancing the interests of big businesses at the expense of middle- and working-class families. Rather than spend their time providing giveaways to wealthy corporations, Trump and Congress would do well to model their next 100 days after President Obama’s first 100 and focus on efforts to create jobs, improve access to health care, and put more money in the pockets of hard-working Americans. Sam Berger is a Senior Policy Advisor at the Center for American Progress. *Author’s note: Table 1 reflects an analysis of only those rules with quantifiable costs or benefits affecting industry or individuals. Qualitative benefits are reflected in Table 2. Where possible, in estimating future costs and benefits, Table 1 reflects 7 percent discounting. For purposes of the oil anti-corruption rule, the table uses as a range the average ongoing compliance costs assuming either no fixed costs or fixed costs. For purposes of determining the benefit to individuals from the Fair Pay and Safe Workplaces Rule, the analysis does not count savings to the government from increased revenue. Where agencies did not provide an estimate for a given value, such as jobs created, Table 1 lists that as “None.” The costs and benefits for different rules may be in dollars from different years, but this will have a very minimal impact on overall estimates. Oil anti-corruption rule (Issued by the Securities and Exchange Commission on July 27, 2016): This rule required oil, natural gas, and mining companies to disclose any payments made to foreign governments for the purpose of the commercial development of their oil, natural gas, or minerals. The improved transparency would have helped to combat global corruption in the commercial development of these resources. It was repealed on February 14, 2017. Stream Protection Rule (Issued by the Department of the Interior on December 12, 2016): This rule better protected water supplies, surface water and groundwater quality, streams, fish, and wildlife from the toxic pollution resulting from surface coal mining operations. It was repealed on February 16, 2017. Firearms restrictions for the mentally ill rule (Issued by the Social Security Administration on December 19, 2016): This rule set forth procedures for the Social Security Administration to include information in the firearms background check system about beneficiaries who are prohibited from possessing a firearm for mental health reasons. It was repealed on February 28, 2016. Fair Pay and Safe Workplaces Rule (Issued by the Department of Defense, General Services Administration, and National Aeronautics and Space Administration on August, 25, 2016): This rule improved federal contractor compliance with labor laws by requiring them to report violations of those laws when applying for federal contracts. The rule also ensured federal contract workers received sufficient information to verify the accuracy of their paycheck and limited the use of predispute arbitration clauses where workers are the victim of sexual assault or civil rights violations. It was repealed on March 27, 2017. Resource Management Planning Rule (Issued by the Department of the Interior on December 12, 2016): This rule updated the process for developing resource management plans on public lands. It increased public input at earlier planning stages and improved information collection efforts in order to improve resource management decisions. It was repealed on March 27, 2017. Education Accountability and State Plans Rule (Issued by the Department of Education on November 29, 2016): This rule implemented the accountability requirements of the recently passed Every Student Succeeds Act, allowing states to incorporate new measures of school quality and student success into accountability measures; use more locally tailored approaches to address struggling schools; provide parents with greater information about how their students and schools are doing; and require timely and meaningful consultation with stakeholders in the development of state plans. It was repealed on March 27, 2017. Teacher Preparation Issues (Issued by the Department of Education on October 31, 2016): This rule defined indicators of quality that states must use to assess the performance of teacher preparation programs and provide more information on the performance of these programs to potential teachers, prospective employers, and the public. It was repealed on March 27, 2017. Drug testing of unemployment compensation applicants rule (Issued by the Department of Labor on August 1, 2016): This rule sets forth which occupations regularly conduct drug testing. Pursuant to a recent law, states can require unemployment agencies to conduct drug testing on applicants for whom suitable work is only available in such an occupation. It was repealed on March 31, 2017. Alaska national wildlife refuge rule (Issued by the Department of Interior on August 5, 2016): This rule protected bears and wolves, including their cubs and pups, from aggressive “predator control” policies designed to artificially increase the number of game species in Alaska wildlife refuges. It also prohibited certain hunting practices on these refuges, such as hunting bears using aircraft. It was repealed on April 3, 2017. Injury and illness record-keeping rule (Issued by the Department of Labor on December 19, 2016): This rule clarified that the employer’s duty to make and maintain accurate records of work-related injuries and illnesses is ongoing and does not expire if the employer fails to create the record when first required to do so. It was repealed on April 3, 2017. Protecting the Privacy of Customers of Broadband Rule (Issued by the Federal Communications Commission on December 2, 2016): This rule required broadband internet service providers to provide clear and accurate privacy notices, to obtain customer approval before using or sharing sensitive customer information, and not condition the provision of service on the surrender of privacy rights, among other privacy protections. This rule prohibited internet service providers from selling information about customers’ web-browsing histories to third parties without their consent. It was repealed on April 3, 2017. Prohibiting provider discrimination in family planning rule (Issued by the Department of Health and Human Services on December 19, 2016): This rule prevented states from barring providers from receiving Title IX family planning funding for reasons other than their ability to provide such family planning services effectively. This prevented states from targeting reproductive health providers such as Planned Parenthood that provide services like contraception, pregnancy counseling, and STI testing to low-income men and women. It was repealed on April 13, 2017. Local retirement savings plan rule (Issued by the Department of Labor on August 30, 2016): This rule made it easier for localities to establish opt-out retirement plans that automatically deduct a specified amount from employees’ paychecks. These plans help private-sector workers without access to employer-provided retirement savings plans to take advantage of tax-favored IRAs in order to save for retirement. It was repealed on April 13, 2017.